Christmas time is the proverbial season of goodwill. For many it is a time for presents, for family and friends and daft Christmas jumpers. Spare a thought for some in the world of sport though, where there is no room for sentiment in the continual pursuit of success. From being sacked, to wasted journeys, to absolute humiliation, not everyone in sport has enjoyed the merriest of times. 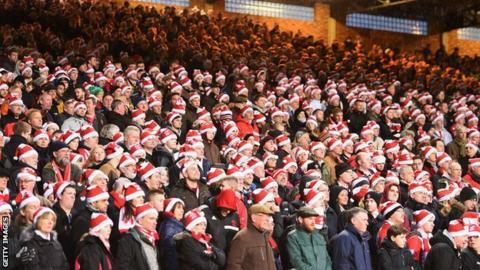 BBC Sport takes a look at some of the more forgettable sporting Christmases. Are you Scrooge in disguise? It wasn't quite the sort of card Nottingham Forest manager Sean O'Driscoll was thinking about on Boxing Day 2012, when he led his side to a 4-2 Championship win against Leeds. But, rather than receiving a message full of festive cheer from the club's owner, he was given his P45 to the surprise of most of Forest's players and supporters. "He can count himself unlucky to have lost his job with the team just one point away from the top six," chairman Fawaz al Hasawi said. He wasn't wrong. Ebenezer Scrooge eat your heart out. He wasn't the first boss to be sacked around Christmas. Remember Les Reed? Booted out by Charlton on Christmas Eve. The Boxing Day Test match in Australia is as traditional as turkey at Christmas is. It was far from a season of goodwill for England cricket skipper Andy Flintoff though who, stuck thousands of miles away from home, saw his international captaincy career end in humiliation. During a 5-0 Ashes whitewash, the Aussies hammered Flintoff's men by an innings and 99 runs in the Boxing Day Test. "On that trip I was probably at an all-time low both personally and professionally," he said later. He never captained England again. Toast and crackers for Christmas? Imagine sacrificing your succulent turkey breast, crispy roast potatoes and lashings of rich gravy this Christmas for a piece of toast and a potato. That is the reality for many jockeys every year as they get ready for one of the biggest dates in the racing calendar - Boxing Day. While most Brits pile on the pounds over the festive period, jockeys up and down the land usually make do with water and crackers in a bid to keep the weight down. "As a footballer I would not get to spend much of the festive period with my family, but it is something I learned to live with." Former Wales and Blackburn Rovers midfielder Robbie Savage describes the hardships of professional footballers at Christmas, with many teams spending Christmas Day away in hotels or in training. It used to be worse. Up until the late 1950s, league football was even played on Christmas Day. Wrexham striker Ambrose Brown didn't have the best of days in 1936 - he was sent off after 20 seconds in a Division 3 (North) match at Hull. Back in time for some Christmas pudding? There was not much festive spirit from Stoke City defender Robert Huth either last year. Perhaps he didn't fancy a trip to Everton on Boxing Day? But it's a different tale on the continent, with many of Europe's top stars enjoying a winter break over Christmas. Some mid-season sunshine for Real Madrid's Cristiano Ronaldo, who tweeted: "Having a great time in Dubai"
"On Christmas Day, I'll be in the freezing cold, carbon coffin that I call home, eating my freeze-dried beef stew and a Mars bar or two, while my wife and son will be in Sweden enjoying a fantastic Christmas." These were the sacrifices that sailor Alex Thomson made in 2012 in his bid achieve his lifelong dream of completing one of sport's most brutal contests - the round-the-world Vendee Globe. A short video conference with his family was his Christmas Day highlight as he battled 10m-high waves on his own in a boat travelling at 40mph. At least it proved worth it. He became the first Briton to achieve a podium finish in the race. Who's having a good or bad Christmas? Read more on Premier League: Who is having a good or bad Christmas? Fancy dress & private jets: How do footballers celebrate Christmas? Read more on Fancy dress & private jets: How do footballers celebrate Christmas?